We need able men across the country who are willing to provide godly aid for jury determinations in Common Law proceedings. This court will utilize the internet to provide due process for each participant. The safest adjudicating hands on earth are of those of a Christian based jury. in and of de jure counties. Court record of – ‘Independent Jural Society Community Court’. – Christian Law and Common Law is synonymous” – Strauss v. Strauss, 3 So. 2nd 772 at 728 (1941). – “the Law of the Land” means “the Common Law“. – State v. Simmon, 2 Spears 761, at 767 (1884). ‘United States of America‘* – proper noun. A country, a people, occupying most of the southern half of North America and including also Alaska and the Hawaiian Islands. federal*, adjective – having or relating to a system of government in which several states, man, form a unity, for a specific purpose, but remain independent in general. Sovereignty was first recognized by the high Court in this case. STATES, 2 U.S. 419; 1 L. Ed. 440; 1793 U.S. Sovereignty was defined and those who are sovereign were identified by this case; and, it is the standing law on sovereignty today. added) Scott v. Sanford, 60 U.S. 393, at 406. Even the States recognize this sovereignty. 63 Tex. Crim. 1; 138 S.W. 1025; 1911 Tex. Crim. App. I have won every credit card case I have ever been involved with in the last 1o years. My client had a $13,581.33 claimed outstanding credit card bill due to the above bank. We challenged all the elements of evidence of a true loan of substantive funds. The bank folded and dismissed the court case. Banks are limited, by congress, to only lending “true” designated funds, they use to do this, now seldom do it. The result is massive profits for the bank, and massive inflation for your community. Take responsible banking and sound money back for you and your community, most every extension of credit by banks today are not compliant with congressional law, or biblical law. This is why your savings are not worth saving. This is crime to the trillionth degree. Crime that is robing your local community of millions of dollars every year. Hire me, I can generally cancel you outstanding credit balances, that is due, with any bank in America. “State” officers treat “vehicles” in their system as “state” property with a “state” legal interest. Remove the evidence of a “state” interest and you are generally left alone. If not you can sue for damages. How to remove you *VIN from the state Department of Vehicles Registration system. Yes you can follow a process that takes the present VIN out of the state system. This removes all association, assumed contract with the state, away from your now private property. After this removal you can re-“record” (for a public record) it in our internet site for private “Record of Owners” where proof of ownership is further assured. Carry a certified copy of the full title. Carry a certified copy of a notarized bill of sale. Carry a notarized personal I.D. Carry a certified copy of the dis-registration documents. Carry a short brief on right to travel and to own property independant of any state of the United States. Carry a shortened URL link for easy access to the location of the “record” of present owner. Carry certified copy of correspondence with the local state Governor of you independant “record”. Have a NOT FOR HIRE plate with ownership contact info in the back window and where plates are generally displayed in your local state. (I put one in the back window because the cops like to tear my plate off occasionally. With your 15$ payment for the M1S-56 Package you will have step by step instructions of how to perfect the removal, and you will also have perpetual use of the “Owner of Record” internet site to record your property, along with all the stories (good and bad) from others that are doing the same process across the nation. Let us work together to perfect “right to travel”, as many are seeking such all across our land. 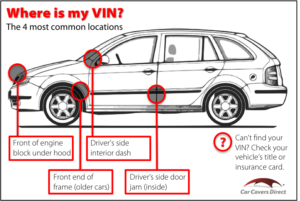 *VIN defined – ‘Vehicle Identification Number’ in U.S. state jurisdiction, and ‘*Chassis Number’ in mans jurisdiction. Did the city claim that you must pay for a hearing before you can stop a taking of a property by a city municipality by demolition. Pay a little counsel time and I’ll show how to turn up the heat on tow companies, impound lots, and city municipality code enforcement NAZIS. M1S-55, Senator gives written notice that ‘Auto Registration’ and ‘Driver License’ is a contract that can be rescinded, 5$. Wayne Stump, State Senator, sends notarized notice to Arizona Department of Public Safety, noticing them that they need to inform the policing agents of the contractual aspects of the Automobile Registration and State Drivers License, with attention of how some have formally rescinded such contracts. This package contains the full letter, with a 14 minute audio from the man that was able to acquire a copy of the notarized notice. I recommend that you send the same to your senator and ask for a similar disclosure response, with instructions of how one contracts, and how one rescinds such contracts with the state. With your payment you will have perpetual access to these correspondences, and the success of the rescinding process. Please send me a copy of the letter you sent in, and a copy of the responses that you got back if any, and I’ll post them for all to learn of how to successfully cancel these godless contracts. Feel free to black out persona; information. Omaha, Nebraska, pastor going down. This girl is a client of mine, we are prosecuting a case against this man, if you have info that can help contact the site email address. That’s it, all US agents fear the common jury, the more independent they are from statism the more they fear them, they fear any court that they do not have the protection of a “state” judge covering for them, they do not ever want to be questioned as to “what written law did you rely upon to have authority to …………….”. The common law jury is entirely different than a legislative governed jury, one is of the people, the other of the state, one is an independent tribunal, the other an advisory, administrative aiding, tribunal. the other merely participates with the state authorities, and only has authority where the People gave it, which is not much. Stay off their land, stay away from all contact (contract) with the US, challenge the rule of full disclosure on all implied contracts (state drivers license, property registration, for example. Stay with the People and the protection of their/your court. 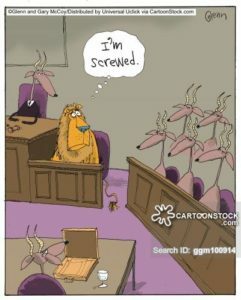 In US courts, liken to the above cartoon, the judge is of the US, the grand jury, prosecutor, and trial jurors, court reporter, even the major newspapers, are all of the US (statists), you are greatly disadvantaged. The “law of the land” is your land, and is what the jury says it is. Now this is 100 years before the Declaration of Independence of 1776. In A.D. 1793, the Supreme Court declared in Chisholm vs Georgia that the American people were “sovereigns without subjects”. Recently there has been a great upsurge of concern of police abuse, as well as expansion concerns. Much of that abuse has been going on for years, the phone camera has brought much of it to your living-room. The police are often times no longer a community member, they are more of a SWAT team that’s eager to swat whatever moves. After twenty five (25) years of studying law there are few things so solidified with me then the fact that “police”, as we know them, are not “our” officers, but rather officers of the “CITY”. POLICE are OFFICERS, “police = policy” / official = enforcer. They owe their life to the COMPANY, and guess what you are not that company. So what are the police in a nutshell, they are people, that have accepted employment, for a wage, to enforce policies, on a specific area of land, that land being owned by their employer, the CITY. All authority of entities in America come through written permission. First the people have authority by grant of God, in America some of that authority is then delegated to what we call the UNITED STATES, which is an extension of the Confederacy between the States (not the People). The UNITED STATES then delegates authority to it’s agents (employees), to apply it’s written laws administratively upon that same land, which we call “state” jurisdictions, which are further divided into various county areas, and again into “chartered” cities. All the above are divided generally into two jurisdictions, the first being the people (common law), and all the rest being administration legislation ( proprietary governance). In America close to 24% is land governed by this US entity, and the remaining balance of land, 76% being under the said common law of the people. So you ask how much land does this include, I’ll just use Omaha Nebraska for an example. Well the answer is close to no land, you see the CITY only owns a small percentage of land in what we “call” the city. To find out if the CITY owns a specific piece of the land just go to the COUNTY ASSESSORS of any given jurisdiction and they can quickly tell you the owner’s name and contact address. Well doesn’t the CITY own all the streets? NO. They own close to none of the streets. One judge tried to convince me that the roads have been abandoned and the city has taken over the care of them. Good try MR, but I need more proof than that. Think about it, your family has parked your car in front of your house, and used that land since roads were invented and they claim it is theirs, ya right, they may even think they own your house also. Well if they do not own it then who does? Well the answer is simple, it is “he” who has proof of a deed, and the CITY is not one of those “he’s”. Well if the CITY does not own it, and we, “the people”, own it, who then has “policy” enforcement on that land? The answer is the owner, and that owner, in America has property rights, one of those property right is “open roads” to give value to your own property. Property that has limited, or no access, is close to worthless. In America such land is under “Common Law”, which is simply the law of the community, now the law of the community is what the jury of twelve say it is when needed, and hopefully seven of the twelve are in-tune with God’s Law, to give a just order for all. Yep, each community is self governed by revolving juries, not by police with revolvers. Stand up, take a moment to learn the truth, it is not all that complicated, if a CITY officer tries to govern you force him to prove territorial jurisdiction, if he can not sue him for pretending to have official authority on land his employer does not own. If cops act up in your community make a community arrest, get his name, summons him to a common law ‘court of record’, and let the chips fall where they may. I started talking of this in Omaha Nebraska courts and soon after the CITY OF OMAHA police chief told every officer to get their house out of their name so that it can not be taken by a civil action, then I was told, by deputy sheriffs of the area, that the top two prosecutors resigned from their jobs (totaling 32 years). All this because I started summonsing them to court, I was told that I would be killed if I do not back off. See more at freeinhabitant.info, pauljjhansen.com. Next time a cop treats you unjustly, or tries to extort money from you without cause just smile and ask if he has a nice house, and then say I like nice houses. Local communities belong to the people, people in America are to be governed by common law. 1. People who wish to unite an organized community jurisdictions that only include land owned by those same people who unite. 2. Those same people hire (elect) a sheriff. 3. The sheriff then aids the people in applying God’s written laws upon that same land. 4. When needed the sheriff can deputize able men from that same united community to aid in the said enforcement of God law. 5. The jury of twelve men, well equipped in biblical law, is then periodically convened, when needed, to determine the remedy for all damages done by individuals on that same land. Acts on US land are subject to US courts. Acts done on the People’s land, are subject to the People’s court’s (common law). Any act, by any man, to take the authority of the People away from the People is tyranny. Start stopping tyranny now in your community.